A number of positions remain unsettled on the 49ers roster, but tight end is among the more interesting considering its usage in Kyle Shanahan’s offense. McDonald, the incumbent, had a career-high 73.5 overall grade last season (ranked 24th of 62 qualifiers), but has struggled with drops throughout his career, posting a drop rate higher than 10.0 percent in all four of his NFL seasons. Through two games this preseason, he’s dropped one of three catchable targets. Kittle missed the preseason opener with a hamstring injury, but was solid in his debut versus the Broncos last week. The fifth-round pick’s 76.3 overall grade was the 12th-best given to a tight end last week (out of 104), highlighted by a 29-yard touchdown in which he ran over Broncos cornerback Chris Lewis-Harris down the sideline on his way to the end zone. 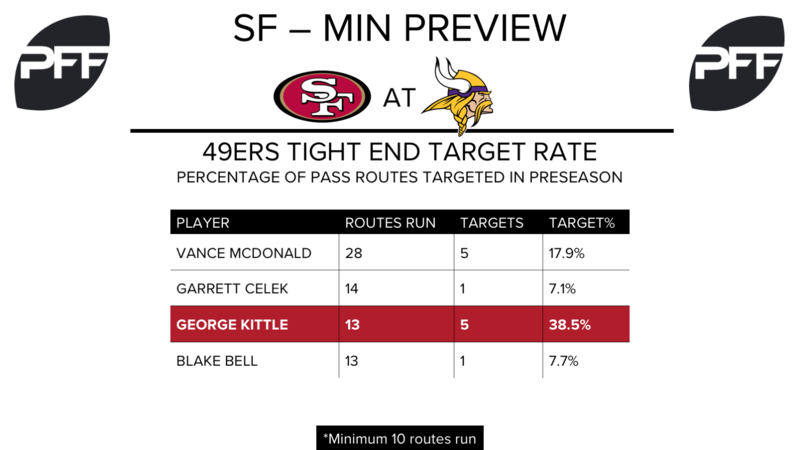 Kittle has been a quarterback favorite when on the field, seeing the ball come his direction on 38.5 percent of his routes run. Tank Carradine, ED — For the second consecutive season, Carradine is impressing in the preseason. In only 25 snaps of work, Carradine has produced at a high level, recording five quarterback pressures and two run stops. Last year, preseason success didn’t translate when the games started to count — he played only 229 snaps and earned a 63.7 overall grade. San Francisco hopes a more natural position fit in their new defensive scheme will lead to improved results in 2017. Eli Harold, LB — With the release of veteran Ahmad Brooks, Harold becomes the starting strong-side linebacker (SAM) for the 49ers. Harold’s been solid this preseason across 37 snaps, earning overall grades of 77.0 and 73.6 against the Chiefs and Broncos, respectively. He’ll need show improvement as a run defender, however. After earning a 48.3 run-defense grade last season (ranked 79th out of 110 edge defenders), he’s posted 50.2 and 49.9 run-defense grades during the preseason. Erik Magnuson, C/G — The Michigan product has been a bit of a surprise this preseason, splitting time between center (45 snaps) and right guard (21 snaps). Magnuson’s 82.7 overall grade against the Chiefs was the sixth-highest given to an interior offensive lineman this preseason, and he’s looked solid both in pass protection (no QB pressures allowed in 28 pass-block snaps) and the run game. As a college tackle, his positional versatility could very well earn him a roster spot with another good performance in Minnesota. Edmond Robinson looks set to be the projected starter at WLB when the season commences. So far this preseason Robinson has seen a total of 65 snaps earning a game grade of 77.5 against the Bills and a grade of 43.8 against the Seahawks. Against the Bills Robinson earned an impressive coverage grade of 84.3 whilst also picking up a stop in run defense. 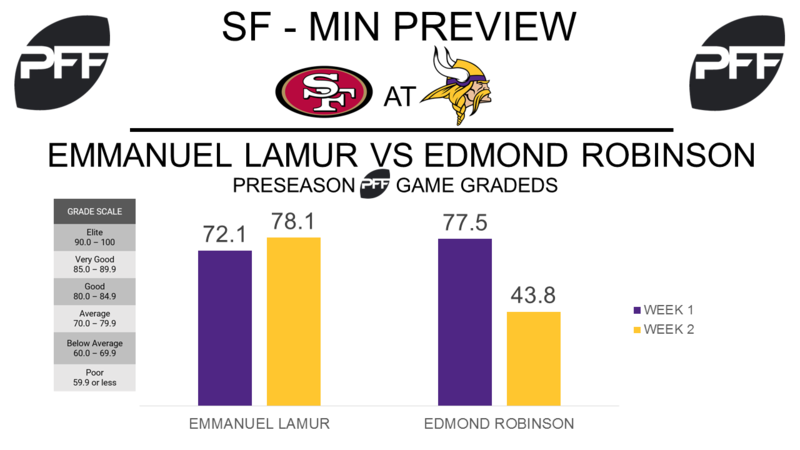 In the Vikings second preseason game Robison struggled to impress his PFF game grade of 43.8 was the lowest of any Vikings linebacker to play Friday night. Whilst posting okay game grades in both preseason game, Lamur has struggled to impress. He did have the highest grade of any Vikings linebacker Friday night against the Seahawks with a grade of 78.1, but he has really struggled in run defense so far this preseason. On his 23 run defense snaps he has run stop percentage of zero after failing to pick up a run stop in either game (a run stop is a tackle made in run defense that results in a “WIN” for the defense). Bucky Hodges, TE – The rookie from Virginia Tech looked good Friday night against the Seahawks. He caught both his targets for 54 yards and a touchdown, and the Vikings quarterbacks had a passer rating of 158.3 when throwing his way. Hodges looks best as the move tight end for the Vikings, making plays all over the field, and his 1.68 yards per route run from the slot was the ninth best among tight ends in the draft class since 2014. Ben Gedeon, LB – Another rookie who hopes to earn significant playing time in the 2017 season is Ben Gedeon. The fourth-round pick has impressed with his run stopping ability so far this preseason. His run stop percentage of 6.7 ranks 12th among 22 qualifying inside linebackers, as he has collected two stops in run defense on 30 run snaps. He was also an efficient tackler in college, in eight Big Ten games last season Gedeon only missed one tackle and so far this preseason he is yet to miss a tackle as well. 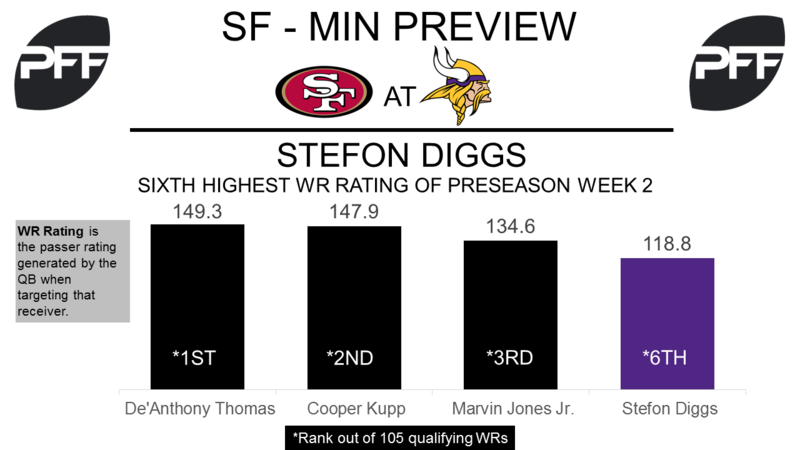 Stefon Diggs, WR – The receiver put on a dominant display Friday night against the Seahawks, earning a PFF game grade of 83.5 and being named in PFF team of the week for week 2 of preseason. He caught four of his five targets and added 15 yards after the catch. His WR rating of 118.8 was the sixth highest by a receiver for Week 2 of preseason. If he can carry this form into the regular season then he should be in store for a special season.